St George’s Mayor Kenneth Bascome and Town Crier David Frith departed Bermuda yesterday [July 23] on their way to Lyme Regis, UK to take part in their Somers Day Parade. The event is a celebration of the life of Sir George Somers, a former Mayor of Lyme Regis who founded the first settlement in Bermuda. While in the UK, the pair will also travel to Kingsbridge and Dartsmouth where St George’s Town Crier David Frith will take part in the Town Criers’ Competitions where the Sir Francis Drake Armada Cup will be at stake. Competitors are judged on the clarity of their voice, their diction, the consistent pitch and volume as well as their appearance. They are provided with a subject upon which to speak and are usually limited to 100 words. Bermuda has done well in past crier competitions with Mr Frith winning the Armada Cup and top prize in the “Best Dressed” competition. 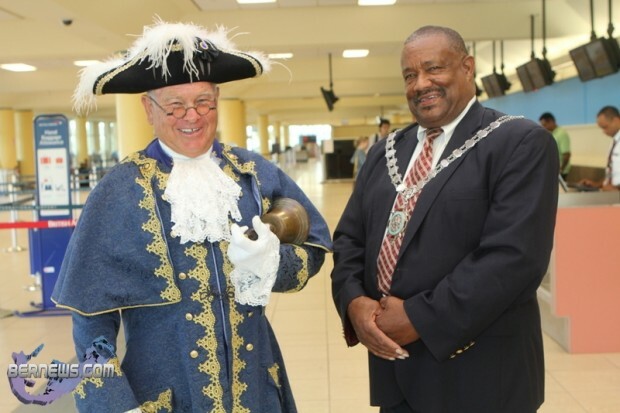 Former St. George’s Town Crier E. Michael Jones won the Armada Cup in 2000 and previous St. George’s Town Crier Major Bob Burns gained the Guinness World Record for the loudest human speaking voice. The people of ST George love you Mayor, you have a kind heart,and look out for the people of the old town. no the people of st. georges do not love the mayor like you think. if he had the people of st. geo best interest at heart he would not have had a prize giving on the square on sat and only invite a select group from the corporation of St. Geo..
and does he still live in the town hall. he has run against Dame jennifer Smith. to my house and she does a lot in the community. will vote for the person and how hard they work. Former Town Crier Jones, has won Best Dressed in 8 competitions, won Kingsbridge, Dartmouth, Armada and European Championships on multiple occassions and placed in the top five in the World Championship three times, bringing back to Bermuda a total of 17 trophies. Was compiling Cup Match stats and happened to find these details.